If You Link To Us! I always encourage people to link to it." 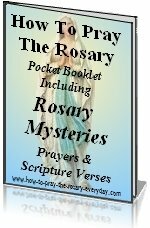 If you are a webmaster, blog owner or publisher of a newsletter and like this How-to-pray-the-rosary-everyday.com site, please feel free to link to us or to any pages on our site. For links to individual pages, at the bottom of most pages you will see a link that asks you to "Enjoy this page? Please pay it forward". All you have to do is click on that link and it will give you the code for that particular page. Copy it and then paste it into your document. It's that easy! 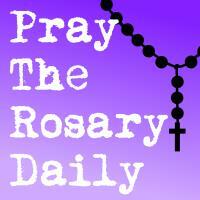 Pray the Rosary daily with meditations, scripture and encouragement from a Rosary community. Be sure to sign up for our RSS to get up-to-date changes as we add more exciting links and banners for you. 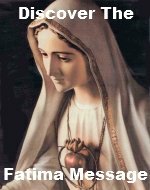 "To those who propagate my Rosary, I promise aid in all their necessities." Please use our banners freely on your site, blog, newsletter or whatever you are publishing. 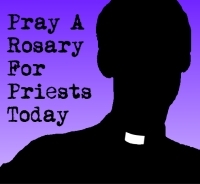 People really love to use these pray the rosary buttons for blogs. We are contantly adding more buttons, so be sure to check back often or sign up for our RSS feed [little orange RSS button located in the left hand column of your screen] to get the latest updates on our site. All you have to do is highlight the code, copy and paste into your document. Unless you are coding your own pages, you don't need to download the picture, re-upload it and then place it in some code. It's all done for you here. If you have any trouble with your banner or links please contact us so we can help you.